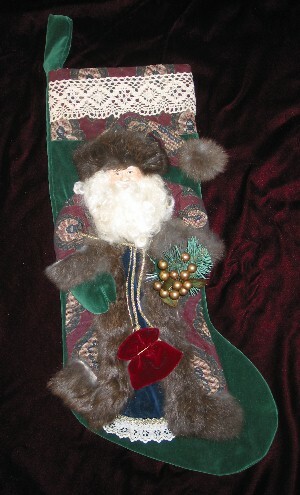 Email Mary to find out about having this stocking created for you, if you are to busy to create one of your own. Remember, this is a wonderful gift for so many on your Christmas list. Santa stocking kits. Wonderful gifts to make for family, friends and business associates. Being able to say you made them is such a good feeling. Surprise that special someone with a "one-of-a-kind" Santa stocking, created by you, to be cherished by many, for years to come. 1.Velvet Christmas stocking, topped with a tapestry cuff, adorned with lace. The colors available are navy, burgandy, red or green. 4. Pattern for Santa's clothing (material not included). 6. "How to" instructions for assembly. Let your imagination soar! Most important, have fun! plus $8.00 for priority shipping, with insurance. 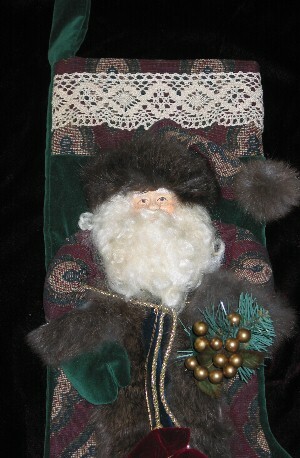 Additional velvet stockings, Santa heads and mohair are available for purchase without a kit. Visit my daughter Audrey Swarz, and view her one of a kind creations.